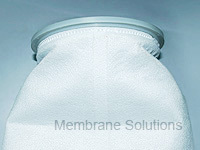 MS® Needled Felt bags are designed to withstand higher solid loading, and are suitable for applications using vessel or open filtration systems. Our integrated technology and superior control over our manufacturing and quality leads to consistent performance. With MS ® filter bags, you can count on what you are getting. We start with the finest material possible. 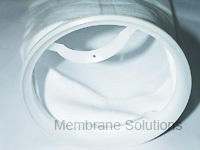 Membrane Solutions, LLC produces the felt material used in our felt filter bags in-house, guaranteeing the highest quality. Our no-bypass welded seams eliminate the possibility of fluid bypass through needle holes. We provide a variety of glazed and singed finishes to inhibit fiber migration.